Two winters in a row for a jaunt such as this for the steadfast Swedes, who are closing out the touring run in support of 2013’s Construct. 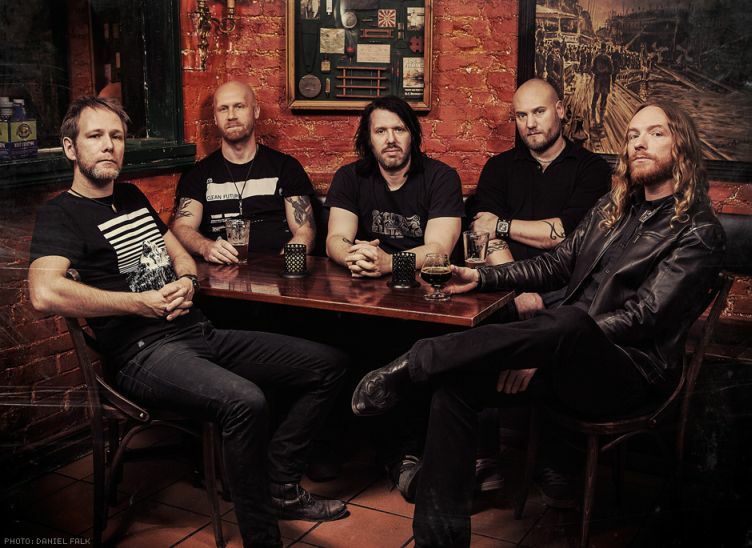 And Dark Tranquillilty’s profile may be sturdier than the band they are often are lumped in with – In Flames, who have taken a considerable nosedive in the sonic department. DT, though, remain relatively on the straight and narrow, with the added element of keyboards serving to enhance – not detour their sound. Along for the ride were fast-rising Finnish melancholic melodic death metal troupe Insomnium, who clearly were the right pick. It’s as if they’re being groomed to reach the next level in this territory. Foregoing all of their early catalog (the band’s In the Halls of Awaiting is an absolute gem), change-of-pace jams “The Harrowing Years,” “Unsung” and “The Promethean Song” provided ample balance, although this scribe wished “Regain the Fire” was slotted in instead. Vanhala has been given roughly 90% of the band’s lead guitar duties, something he handles with aplomb (of course), while the clean vocals of fellow guitarist Ville Friman had a rough go in the mix department. Nevertheless, stirring stuff. Onward to bigger things for sure. Still touring without a bass player (several of this scribe’s fellow concert goers have a difficult time with that), Dark Tranquillity rolled out largely the same setlist as last year, launching into “The Silence of Noise,” “White Noise/Black Silence” and “Damage Done” rather effortlessly. And perhaps that’s the only beef with DT; they’re not exactly visual marvels, even with the assistance of a fancy-pants video backdrop. Vocalist Mikael Stanne does his best, perpetual smiles and theater-like moves and all. Nothing wrong with seeing a frontman smile, ya know?